mon petit lyons: Covert Robin Linky Time! the link-up will stay open all month. by linking up, you'll be entered to win one of these ten fabulous prizes offered by my fabulous co-hosts!! 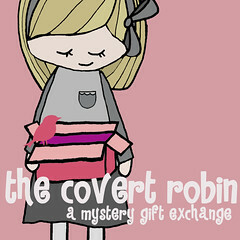 prizes will be randomly awarded, and winners will be announced on may 4. the only rule is that your post must be about the covert robin gift you made and/or received. please note that you need only to link your post once, and it will appear in the link-up on each of the co-hosts' blogs. Ack, sorry about that post... forgot I was signed in as our guild account! I wanted to comment that it's so fun to see what everyone has been working on. I'm patiently waiting to see what I receive, and to see what my partner posts about what I sent!